LG 105 inch 21:9 curved LED TV leads 2014 4K line-up | What Hi-Fi? Once again CES looks likely to be a battle to see who can deliver the most headline-grabbing TV, and the LG entry for 2014 comes in the shape of a – wait for it – 105in, 21:9 aspect ratio, curved LED, 4K Ultra HD TV. LG and Samsung teased 105in 21:9 TVs last month, and LG has now confirmed its flagship super TV alongside its premium 9800 4K TV range. The LG 105UC9 has a 21:9 aspect ratio and in fact sports a 5120 x 2160 "5K resolution". Following in the footsteps of Philips Cinema 21:9 TV (discontinued due to lack of interest...), the LG set matches the aspect ratio of most films and eliminate the black bars either side of a film. The 105in curved LED 4K TV also has a "7.2 multichannel sound system" supplied by Harman Kardon, part of LG's new Ultra Surround concept, which seems to see the brand focusing on improving its TVs' sound. This monster TV sits above LG's premium UB9800 range of 4K Ultra HD TVs for 2014, which comprises 65, 79, 84 and 98-inch TVs, as well as the previously revealed LG 4K Ultra HD OLED TVs. The LG 9800 range sports a proprietary chip that claims to improve the picture performance and keep motion smooth (4K Motion Estimation Motion Compensation MEMC). The set can play 4K content from HDMI, USB or LAN connections, and decodes 4K signals in both H.264 and HEVC H.265 formats. 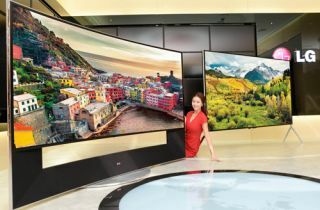 The new 4K TVs also sport LG's latest passive 3D technology and wide angle viewing thanks to the IPS technology display. We'll be on hand at the LG press conference later today to see the TVs in the flesh and get hands on with the products at the LG stand.